U.S. 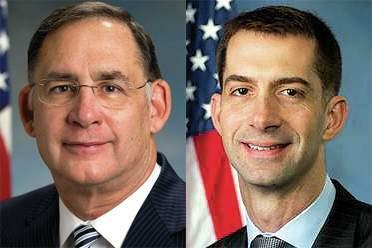 Senators John Boozman and Tom Cotton of Arkansas. Under the deal Iran will reduce stockpiles of fuels that could be weaponized, cut its number of centrifuges, and subject its facilities and nuclear related commerce to international inspections. Iran could continue to utilize nuclear technology to generate energy and billions of dollars in sanctions tied to the nuclear program would be lifted. Congress has 60 days to review the deal and Arkansas’s members have promised to push back against lifting sanctions as part of a Congressional review. President Barack Obama has pledged to veto any attempts to pass new sanctions or derail the agreement struck between Iran and the five members of the United Nations Security Council (United States, United Kingdom, France, Russia, China) plus Germany. A group referred to as P5+1. The deal calls for Iran to reduce its 19,000 centrifuges by two-thirds, reduce a uranium gas stockpile from 10,000 kilograms to 300 kilograms, limit the purity of uranium enrichment well below weapons grade levels, and end its plutonium production entirely. International inspectors would be granted access to Iranian nuclear facilities and are to track uranium from the time it’s mined to its use and eventual storage as spent nuclear fuel. Most provisions last 10 to 25 years. In return for the reduction of nuclear capability, allowing inspections, and pledging to abandon nuclear weapon ambitions the U.S. and other world powers agreed to lift billions of dollars in sanctions as benchmarks are met in the dismantling of the Iranian nuclear program. The President touted the results of two years worth of negotiations in a speech Tuesday morning in Vienna, Austria. “We do not have to accept an inevitable spiral into conflict. And we certainly shouldn’t seek it. And precisely because the stakes are so high, this is not the time for politics or posturing. Tough talk from Washington does not solve problems. Hard-nosed diplomacy, leadership that has united the world’s major powers offers a more effective way to verify that Iran is not pursuing a nuclear weapon,” the President said. However, for Arkansas’s Congressman attempting negotiations at all is unacceptable and the existing deal won’t prevent Iran from developing nuclear weapons. U.S. Senator Tom Cotton has been at the forefront of Republican voices denouncing negotiations with Iran since authoring an open letter to Iranian leaders in March attempting to undermine negotiations by suggesting the next President could reverse the deal and that Congress had the power to block it. Speaking after the President’s speech, Senator Cotton took to MSNBC and called the deal a “terrible, dangerous mistake.” He said Iran’s funding of proxy forces in the Middle East precludes any deal that would lift sanctions while any part of a nuclear program remains. Today Iranian backed militia groups are fighting ISIS in Iraq in a poorly defined relationship with the United States and Iraq’s government. 4th District U.S. Representative Bruce Westerman told KUAR negotiations should have never been held at all because of Iran’s involvement in conflicts throughout the region in places such as Yemen, Syria, and Palestine and further around the globe. U.S. Representative Rick Crawford of the 1st District told KUAR much the same. President Obama addressed such concerns during his remarks. “But I will remind Congress that you don’t make deals like this with your friends. We negotiated arms control agreements with the Soviet Union when that nation was committed to our destruction. And those agreements ultimately made us safer,” said Obama. “Now, that doesn’t mean that this deal will resolve all of our differences with Iran. We share the concerns expressed by many of our friends in the Middle East, including Israel and the Gulf States, about Iran’s support for terrorism and its use of proxies to destabilize the region. But that is precisely why we are taking this step — because an Iran armed with a nuclear weapon would be far more destabilizing and far more dangerous to our friends and to the world. In addition to outrage over Iran’s involvement in regional conflicts Arkansas’s delegation fundamentally distrust the Iranians to follow through with provisions of the nuclear agreement. Iran continuing to operate nuclear facilities for energy purposes is a farcical violation of the terms in waiting, according to Representative Crawford. Senator John Boozman offered KUAR a similar take. “You have to ask what’s Iran using centrifuges for? If you take two-thirds out there are still thousands of them so as long as they’ve got centrifuges they’re able to enrich nuclear material,” said Westerman. President Obama contended inspections have the potential to work and their presence indicates the opposite of a trusting relationship. “Because of this deal, we will, for the first time, be in a position to verify all of these commitments. That means this deal is not built on trust; it is built on verification. Inspectors will have 24/7 access to Iran’s key nuclear facilities. Inspectors will have access to Iran’s entire nuclear supply chain — its uranium mines and mills, its conversion facility, and its centrifuge manufacturing and storage facilities. This ensures that Iran will not be able to divert materials from known facilities to covert ones. Some of these transparency measures will be in place for 25 years. Because of this deal, inspectors will also be able to access any suspicious location. Put simply, the organization responsible for the inspections, the IAEA, will have access where necessary, when necessary. That arrangement is permanent,” Obama said. If Iran does violate the terms of the nuclear deal as Arkansas’s delegation suspects, the President said there will still be time to act and sanctions would return. “Iran must complete key nuclear steps before it begins to receive new sanctions relief. And over the course of the next decade, Iran must abide by the deal before additional sanctions are lifted, including five years for restrictions related to arms, and eight years for restrictions related to ballistic missiles,” said the President. Representative French Hill of central Arkansas’s 2nd District also panned the negotiations and the President in a statement but offered to a limited degree a more tempered view of Congress’s role in the evaluation of the agreement. “I have been skeptical about this negotiation from the beginning, as it has fundamental and long-term consequences for our Nation, our allies, and the region. Congress now must exercise its oversight responsibilities and assess the proposal’s most critical elements related to snap-back bilateral and multilateral sanctions, international inspections and access, the status of the four Americans currently held as prisoners in Iran, and the potential $140 billion windfall for the world’s largest state sponsor of terrorism. But Representative Hill, like his colleagues also stated any nuclear deal has to include the discontinuation of the entirety of Iran’s nuclear infrastructure. Senator Boozman also was critical of the “snap-back” of sanctions the Obama administration says are in place if Iran violates the agreement. “If we lift sanctions, that really is where Congress has a huge impact in weighing in, if we lift the sanctions, which are what brought the Iranians to the table to begin with, why they bargained…But if we lift the sanctions and then they do cheat, and I think there is great chance that they will cheat, what do you do at that point? I think that’s really a huge problem and it would be very, very difficult to get those back in place,’ said Boozman. Arkansas’s Congressional delegations argues further sanctions will pressure Iran to give up its nuclear program or at the least further hamper the Iranian state. The President said if it works it’ll have a big impact in the near term and lead to a greater potential down the road. And if it doesn’t the President believes the U.S. will know about it and be able to react from no worse a position than now. “Because of this deal, Iran will remove two-thirds of its installed centrifuges — the machines necessary to produce highly enriched uranium for a bomb — and store them under constant international supervision. Iran will not use its advanced centrifuges to produce enriched uranium for the next decade. Iran will also get rid of 98 percent of its stockpile of enriched uranium. A bill sponsored by Arkansas’s fourth District Congressman Bruce Westerman, to recalibrate management plans of forests on federal lands has passed the U.S. House of Representatives. The bill passed on a 262 to 167 vote, with many Democrats voting against. On the house floor Westerman spoke of the need for better forest management. Republican U.S. Sen. Tom Cotton is proposing blocking federal funding to cities that refuse to cooperate with federal immigration policies. The freshman lawmaker from Arkansas on Wednesday proposed an amendment to an education funding bill that would make so-called "sanctuary cities" ineligible for federal immigration and law enforcement grants. A measure filed Thursday by Arkansas's Fourth District Representative would direct expanded Medicaid funds to the ailing Federal Highway Trust Fund. Republican Bruce Westerman's bill would direct expanded medicaid funds to the Fund. The bill would lower the amount the federal government contributes to state Medicaid programs, expanded under the Affordable Care Act, by returning the federal matching rates to pre-expansion levels.